I have to admit, I'm not much of a mushroom fan. I usually pick them out if they're served to me in restaurants. Mark thought I was insane for wanting to make mushroom tacos but hey I had to make something out of the Herbivoracious Sandwiches and Tacos section and it just seemed to be the best option to go along with my diet. I again made a couple of small substitutions and two of them were not on purpose. The recipe calls for shitake mushrooms but I messed up and got portabello mushrooms. I didn't want to go back the store and get the right kind because I would probably never use the portabellos so I just went with it. They can't taste that different right? The other accidental substitution I made was with the type of pears. The recipe calls for Asian pears but I wasn't able to find any at PCC when I did my shopping so I went with my favorite pear, the d'anjou. The last substitution I made was on the oil. I don't use vegetable oil anymore, so I used coconut oil, the oil I use most for cooking with. One of the things I like best about the Herbivoracious Cookbook are the labels next to the recipes indicating if they are vegan or gluten free as well as the amount of servings and time it takes to make. It's very helpful information and I wish all recipes had that info. Unfortunately, they always seem to take longer to make than the recipe says. It could be because I spend a bit of time taking pictures and video. I surprisingly ate the tacos without picking out the mushrooms and actually enjoyed them. The mushrooms soaked up a lot of the flavors from the onions and jalapenos so they didn't really taste like mushrooms but I don't plan on adding them to my diet on a regular basis. I had extra filling leftover so I used it as stuffing for a roasted acorn squash. 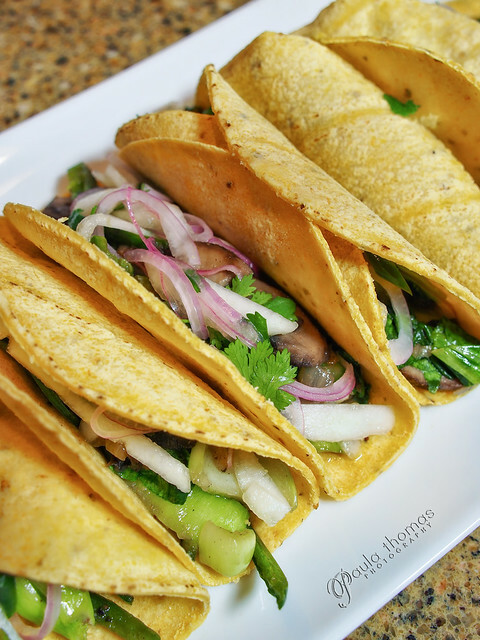 Check out the video below if you want to see what all is in these tacos and make them yourself. This is wonderful, Paula, thank you as always for doing it! I'm sure your substitutions were delicious.